Note: In order to create a new plan, you must have a carrier created. Click on the plan management settings. Click on the Add carrier button on top of the window. Enter the master carrier by clicking on the drop-down menu. If you're not able to find the master carrier, you may enter its subsidiary. For example: If you're creating a Straight talk carrier which is not listed under master carriers, you would select Sprint as your master carrier because Straight talk is a subsidiary of Sprint. Therefore, you would Select Sprint as your Master carrier, and straight talk as the carrier name. Select the Bill Payment Product( topup ) by clicking on the drop-down menu . ( Used for doing topup payments through the dashboard, to add to invoices). If the product does not exist you may click on the Add new product button to create the new topup product. For more information Click Here. Make sure the Active box is checked, and click save. Then, click on the drop-down menu for settings. Then, click on the New Plan button. Select your carrier by clicking on the drop-down menu. Enter the plan name in the plan name field. Enter the Plan amount in the bill amount field. 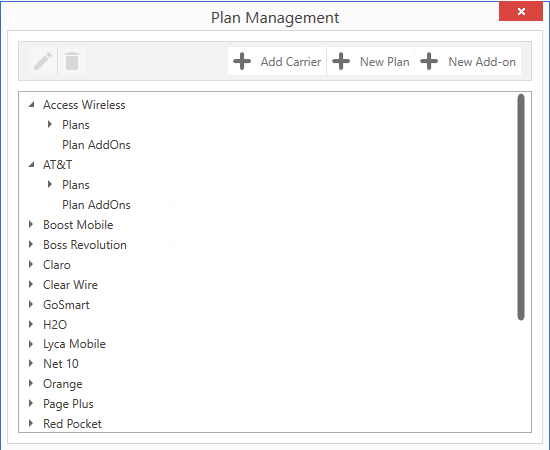 Click save or Save and add more to add more plans to the carrier. From the list of the carriers you created, select the carrier and carrier plan you want to add the add-on to by clicking on the small arrow. Then click on the New Add-on button on top. Enter the name of the Add-on in the field. Enter the amount of the Add-on. Note: You can also edit your carrier and add-ons following the same steps. Select your carrier from the list and click on the small arrow to expand the list. Click on the Plans to view your plans. Select your plan and click on the pencil icon on top to edit the plan. Make the necessary changes to the plan, and click save.